As a Kapost Admin, you have the ability to configure rules in Gallery that will sort content into the right collection for you. This feature saves you the time and effort of manually adding content to specific collections. You can choose to have content automatically sorted via the Auto Add Content setting or you can manually approve content to be sorted into your collections when it meets the rules. To set up rules, go to Gallery then click Manage Content in the upper-right hand corner. Next, select the collection from the list on the left hand side that you would like to create rules for. Once you have selected a collection, click Settings in the upper-right hand corner. On the Settings page, scroll down until you see Collection Rules. Notice the toggle for Auto Add Content. When this toggle is turned on, any new content fitting the below rules will be automatically added to this collection. When this toggle is turned off, any new content fitting the below rules will need to be manually accepted or dismissed before being added to this collection. You will receive in app alerts with the option to add the content to the collection. See below for detailed information about how sorting will work. These rules operate based on the custom field tags associated with your content. For example, let’s say you want all Blog Post and Infographic content that is tagged with the region EMEA to auto add to a specific collection. To do this, you would first select Content Type from the first drop-down in Collection Rules, and then multi-select Blog post and Infographic from the second drop-down for Rule 1. Next, under Rule 2, you will select region for the first drop-down, and EMEA in the second. This will make sure that any item fitting these parameters will be automatically added to the Collection as soon as you select Add to Gallery from the Studio for that content. When you create a collection and rules, it evaluates all content to see what fits and it puts it into the collection. Sorting can take up to 5 minutes so be patient. 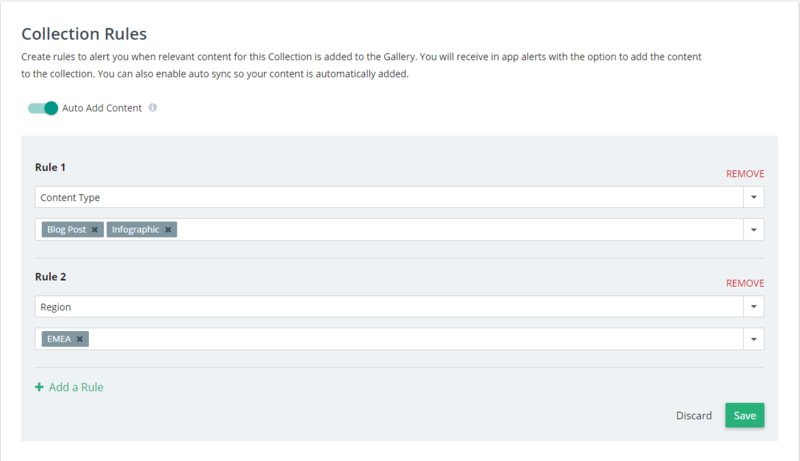 When you add new content to the gallery, it also gets evaluated to go into collections where it fits the rules. When content is completed in Studio and uploaded to a Gallery Collection, it is not automatically published. You must give the content a URL in Studio. If you ADD a tag on a content asset that's already in the Gallery, that content will be evaluated for it's new tag. If you REMOVE a tag on on a content asset that's already in collections, that content will NOT be removed from any collections. If a new rule is added to a Collection that already had a rule(s), all content in the Gallery will be evaluated for the new value(s) and added only if it fits the new value(s). No content will be removed from the collection. If content is removed from the Galley and then re-added, it will be sorted from scratch and will only exist in the collections where it matches the rules at that time it's re-added. If content is manually removed, or declined from being added to a collection, it will no longer appear in the collection - regardless of rule changes - unless you reset the collection or manually add it back into the collection. If you have made many adjustments to your taxonomy and/or collection structure, you may want to take advantage of the Reset Collection function. This will remove all content from the collection and re-add all content that matches ONLY the rules at the time the collection was reset. All content manually removed from the collection will be “blacklisted” from the collection until you reset the collection. At that time, previously "blacklisted" content will go away and that content can be added back into the collection if it matches the rules. Read this article for information on using Bundles in Gallery.